We are starting to teach Rio how to read in Filipino. 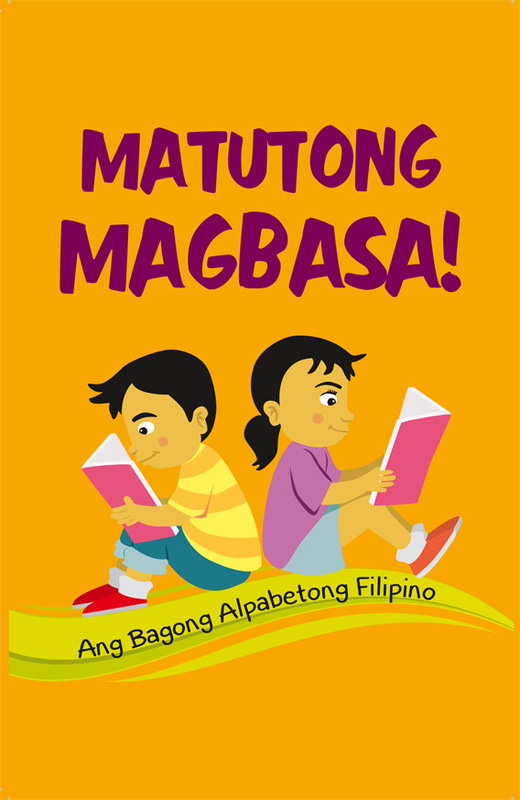 We are using the book "Matutong Magbasa : Ang Bagong Alpabetong Filipino", released by Anvil Publishing. We bought the book less than a month ago ( P145.00 in National Book Store, Glorietta) and we are happy that Rio reacts and responds positively during our learning sessions. We decided to teach our son to read in Filipino first because we think this will help us in introducing words and eventually lead him to speaking the language fluently. Anyare? Bakit hindi siya marunong mag-Filipino? I admit that sometimes I find it hard to explain why our son does not speak in Filipino. We always have ready answers : Kasi po he always watches cartoons in TV and YouTube. He has that accent because of Hi-5. Nag-e-English ba kayo sa bahay? I answer, "Hindi po," but I remember the many times I have spoken to my son in English while we ( Lola M and Tatay) converse in Filipino all the time. 1) Talk to him in Filipino. Aminan na ito. Yes, we also talk to our son in English. This habit makes it more difficult for him (and for us as his teachers, too! ) to learn and speak in Filipino. Ako rin ang palaging nag-eEnglish! Instead of encouraging my son to speak in Filipino, most of the time I engage and talk to him in English. Kaya naman pala e! That's why I put this reminder on top of my list. Note to myself : Nanay, mag-Filipino ka! Kain na tayo, anak. Tulog na tayo. Ligo na. Maglaro na lang tayo kaysa manood ng TV, anak. Start with Filipino action words he can easily identify in his daily routine. 2) Finish the Filipino reading lessons this year. We haven't finalized our DIY preschool homeschool curriculum for this year. But it looks like it's going to be our last homeschooling year so we really have to define our goals before Rio goes to big school next year. 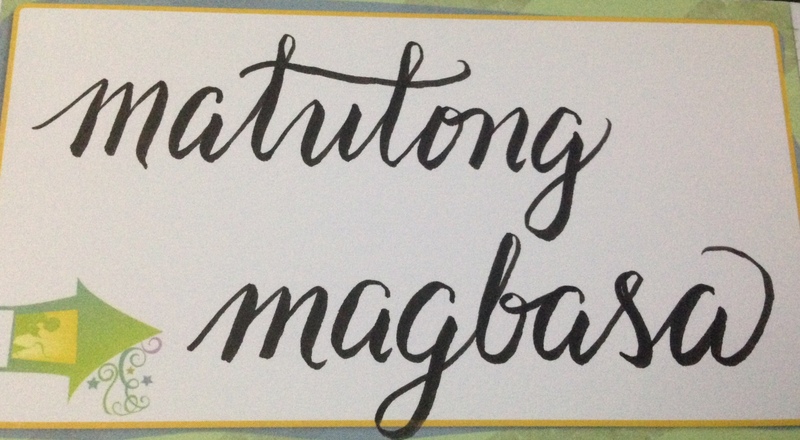 Finishing all the reading lessons in "Matutong Magbasa" will definitely be one of our goals. We're actually getting things done quite fast. We have finished our lessons on vowels and letters Bb, Kk, Tt, Mm and Nn. Rio can now read Filipino words with combinations of these syllables - ba-ka, ta-o, ma-bu-ti, i-na, a-ma. The challenge is how to sustain the lessons and make it more interesting. We combine constant review of past lessons and a little motivation through simple rewards for our son to make him more focused on his work. 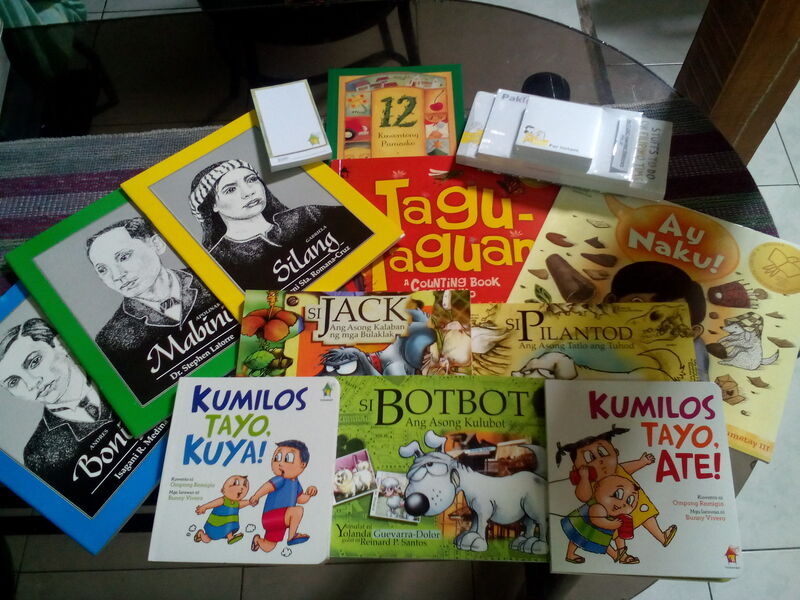 3) Read more Filipino storybooks. We have collected a number of Filipino storybooks and we make it a point to read them to Rio immediately. We have read many stories to him but there are only a few books that he really enjoyed. There was a time when all he wanted to read was Ang Barumbadong Bus. He learned about the words, a-raw, u-lap, ma-bi-lis from our endless storytelling sessions. We shifted to the storybook Si Pilong Patago-tago and he was so excited to say Pilo's favorite word, "Bulaga!". We have more children's storybooks in English in our book shelves and most of our storytelling sessions when he was younger were all Sandra Boynton or Eric Carle stories. We are only starting to build our collection of Filipino books now. 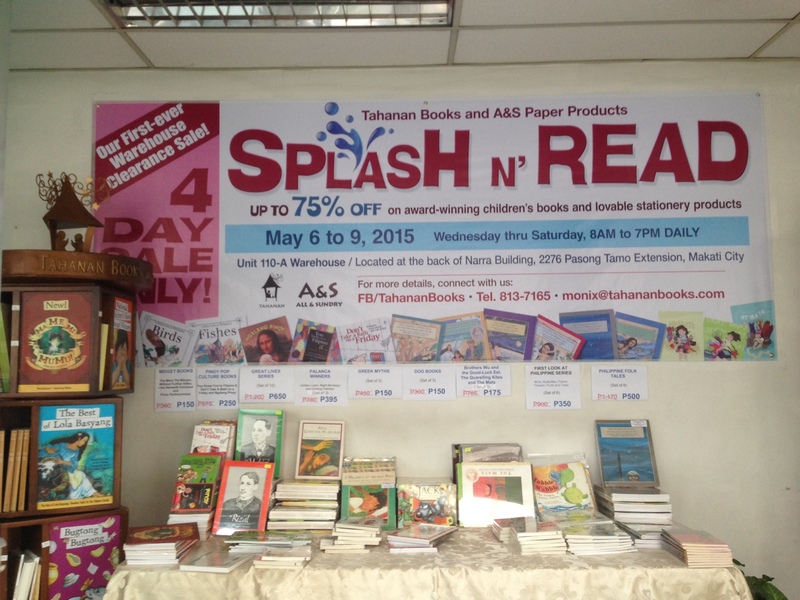 Last Saturday we went to Tahanan Books' Splash and Read Sale and we are so happy to add these books to our growing collection. We will start working on our preschool homeschool curriculum this May and we plan to start our "formal" classes in June. We also plan to download old episodes of Batibot and SineSkwela in YouTube and we'll use the videos in our homeschool lessons too. 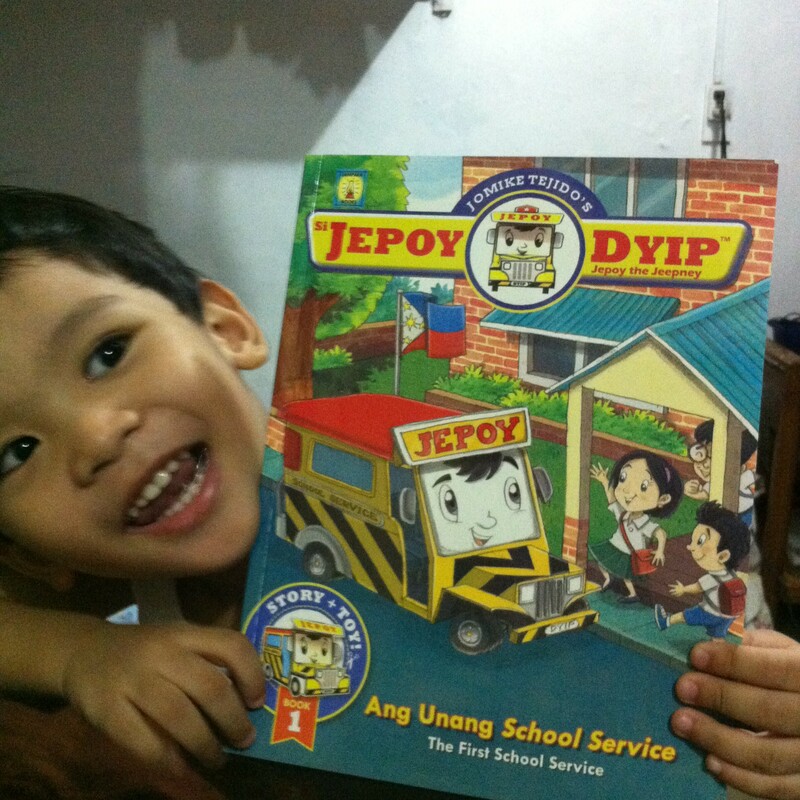 Nanays, do you have suggestions on how we can teach our son to speak in Filipino more fluently and confidently? Salamat sa inyong mga mungkahi! Mayroon pa pala akong pahabol na mungkahi. 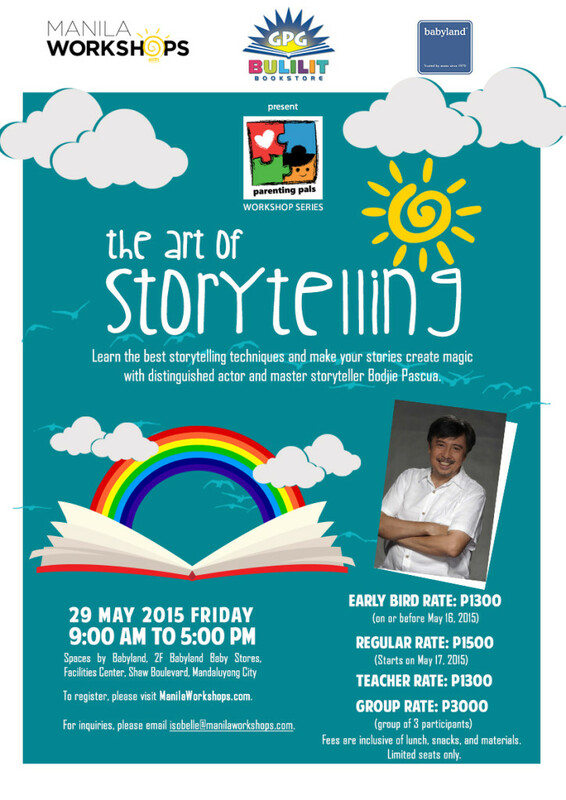 If you want to share more fun and entertaining storytelling sessions with your children, don't miss the opportunity to be trained by The Ultimate Pinoy Storyteller, Kuya Bodjie Pascua! I have attended a workshop that he facilitated and I went home very inspired and motivated to read aloud more stories to my son. Ano pang hinihintay ninyo, mag-register na! Please type NTNDLKUYABODJIE2015 in the Referrer Code so they would know that you heard about the workshop here in our little nanay’s tambayan. Click here to register. These are great homeschooling materials! I'm introducing phonics reading to my son and I think these can go hand in hand with his simple English books! Thank you for sharing. Thanks for reading! Teaching our children how to read ( English or Filipino) is both challenging and fun. Happy reading! I thought teaching children is easy but it's really very challenging. Kids are an empty tablet, we really need to teach them step by step. Mainam na pumunta sa mga pagpupulong na ganito kung saan maaring matutunan ang pagiging mas matatas na pagsasalita ng wikang Filipino. Kailangan ng ating mga anak na maunawaan na hindi lamang sa Wikang Ingles maaring maging mahusay sa pagkukuwento. My son's first language is English kasi yun ang turo ng therapist. Late kasi sya nagsalita, so isang language daw muna. Now, hirap syang magtagalog, pero unti unti nakakaintindi na. Thank you for this post! I must learn from your efforts. We will be moving back to the Philippines soon and my son will be struggling with Filipino.